Live from East Peoria, it’s Saturday Night starring this week’s host, Lou’s Drive-in and featuring special guest stars Jeanette Brickner and the Lou’s Girls! 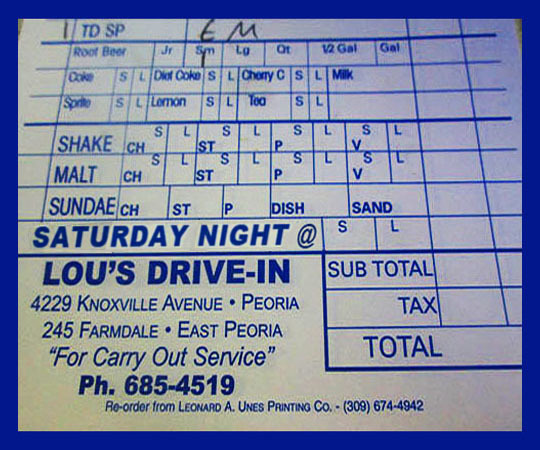 Now, please welcome all the way from East Peoria, this week’s host, Lou’s Drive-In! I’m anxious to check out the new Lou’s Drive-In in East Peoria, but we’ll have to suffer a white-knuckle drive over the bridge to do it! Okay, we’ve made it over and there’s a drive-by shot of the new Lou’s Drive-In! Let’s park and go take a look at it. I like the sign, it’s got the same Lou’s logo that we’ve all loved for decades! This place used to be a Sonic Drive-In, so it was already all set up for Lou’s to move in to. There’s a picnic area up front and off to the side is where you park for curb service if you want to dine in your automobile. One thing that’s different here from the Knoxville location is that they have drive-through service. This Lou’s is going to be open all year round, so the drive-through will probably be popular in the winter time. As you can see, they’ve got a line at the window tonight! 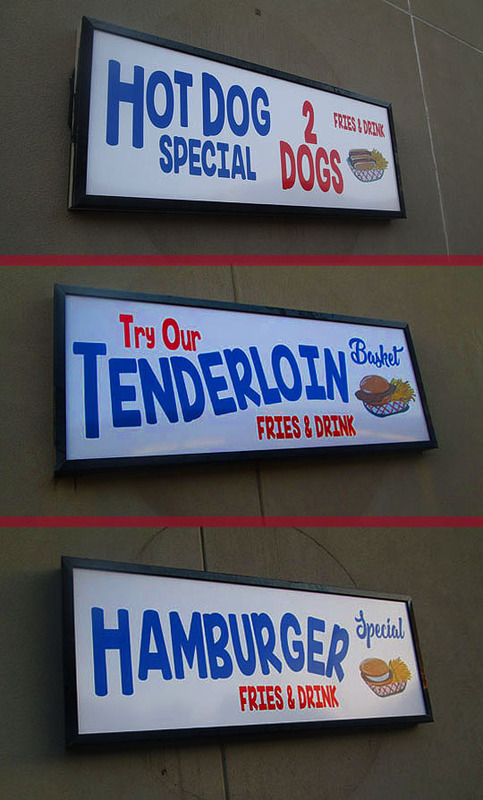 Signs for food specials and baskets are positioned on the outside walls. I haven’t had a tenderloin in years here, that might just be tonight’s Saturday dinner! I went back to the picnic dining area and checked the menu and as I was perusing it, my friend Jeanette Brickner came over to say hi with a mug of root beer in her hand! Hi Jeanette! Always great to see her! 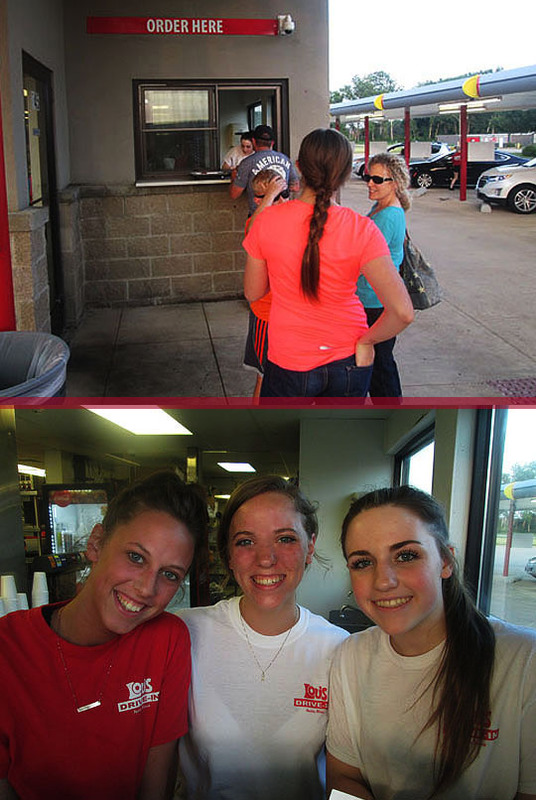 I got in line to order and as I got up to the window I was greeted by three of the Lou’s Girls on duty this evening! I didn’t write down their names but all three are looking very cute tonight and they said it’s been exciting since the grand-opening happened a couple weeks ago and that business has been excellent! You pickup your order over at this window and I took a shot of the kitchen and as you can see, it’s very busy back there! And there’s tonight’s order served up by yet another cute Lou’s girl who’s name I didn’t write down. Next time I come here I need to bring my pen and notebook! I found a nice table to sit down at, took a birds-eye view photo of my dinner and had a drink of their home-made root beer to start the dinner off. It was refreshing and delicious as always! The Lou’s tenderloin! I had to get it after I saw the sign and it did not disappoint! I got it with “everything” and added some extra mustard on top of it. It was a fantastic tenderloin and a wonderful night at the new Lou’s in East Peoria! I got the Tenderloin Basket with a mug of Lou’s Root Beer and it was a perfect dinner for a warm summer evening in East Peoria. The fries were crispy and golden and the root beer had the unique Lou’s flavor that I’ve loved since I’ve been a little kid who could barely hold the mug! I haven’t had the tenderloin at Lou’s for years and it was crispy on the outside and juicy and delicious from the first bite. The bun was bakery fresh and the portion was a perfect size. Three and a quarter Galloping Gourmets—It may be a new location for Lou’s, but the food and root beer remain the same and that’s a delicious and wonderful thing! Glad they made an abandoned and empty space in East Peoria come alive with the Lou’s Drive-In spirit! Related Posts: Saturday Night @: Ulrich’s Rebellion Room, Shogun Japanese Restaurant and Davis Bros. Pizza.